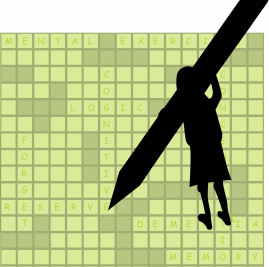 You’ve no doubt heard that challenging your mind with mental games—like crossword puzzles—can help prevent the symptoms of Alzheimer’s disease (AD). Here we we take a closer look at an especially interesting finding made in laboratory mice that show how this works. No, scientists don’t have mice solving tiny crossword puzzles in the lab, but they do have them solve a variety of “puzzles”—such as finding their way through a maze—that challenge the brains and minds of mice in the same ways that crosswords and other puzzles challenge us. A very intriguing study, conducted by researchers in the laboratory of Dr. Frank LaFerla at the UC Irvine Institute for Memory Impairments and Neurological Disorders (UCI MIND) , looked into this question. The researchers used a unique line of mice generated by Dr. LaFerla that were engineered to develop both major hallmarks of AD: plaques (composed of the beta-amyloid protein) and tangles (composed of the tau protein). The researchers studied two groups of mice. One group was challenged to solve a puzzle known as the Morris water maze. The other group was treated identically, including being removed from their cages and handled like the first group, but they were not trained on the maze. Incredibly, despite the very slight difference between the group, the mice exposed to the mental puzzle showed less plaques and tangles than the other group. There was a very important finding from this study: the beneficial effect was much larger if the training was started before the initial development of the plaques and tangles. This is a recurrent theme in AD research, and it is why we strongly recommend taking action as early as possible. DONATIONS BOTH LARGE AND SMALL ARE NEEDED. ANY AMOUNT IS APPRECIATED. Worry about your memory? Take action NOW! 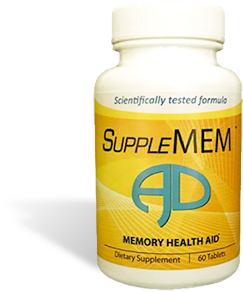 Introducing SuppleMEM™ AD, an exciting new memory health aid that contains the same formula shown to prevent Alzheimer’s disease (AD) symptoms in scientific studies on animal models. This medical food cocktail is one of our Top Tips for Alzheimer’s Prevention. Even more exciting, 25% of net proceeds will be donated to the AD Foundation! Now you can do something about your memory and help fund Alzheimer’s research.